Unemployment has been a fixture in the news since 2008, but relatively little has been said about wages. So how have wages changed as the U.S. has weathered the Great Recession and the spike in unemployment? Most people would expect that wages have decreased, but data in FRED offer a different perspective. The graph above shows two time series from the Bureau of Labor Statistics: unemployment (red line) and private industry wages and salaries (green line) from the employment cost index. Note that even when unemployment rapidly doubled, the green wages line continued to rise (albeit at a reduced rate). In other words, as the economy contracted and employers sought to cut costs, they almost exclusively opted to lay off workers rather than negotiate for lower wages. This phenomenon is known as downward nominal wage rigidity: During macroeconomic shocks such as recessions, wages remain “sticky.” Of course, it’s possible that inflation is cutting real wages even if nominal wages aren’t changing. However, when we adjust the wages data for inflation in the graph below (blue line), the pattern remains similar. Although real wages posted a slight decline several years after the recession hit, it pales in comparison to six years of elevated unemployment. How these graphs were created: For the first graph, search for and add the unemployment series (left y-axis) and the total wages series (right y-axis). 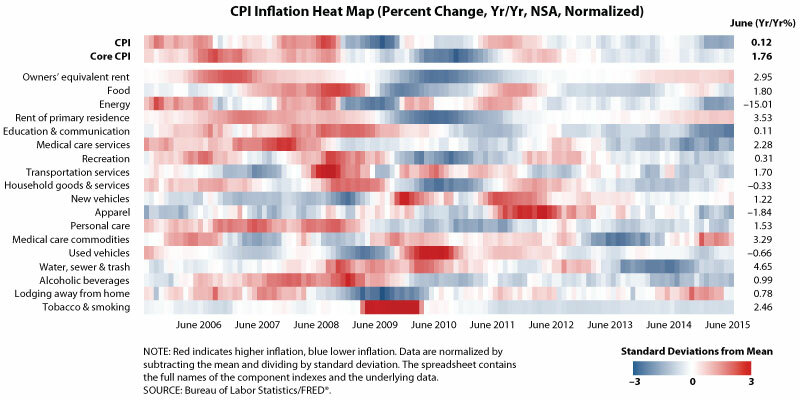 For the second graph, add the wages series (a) and the consumer price index (b) as parts of a single data series. Do this using the “Modify Existing Series” option within “Add Data Series.” Set the units for both (a) and (b) to “Index” with the observation date equal to 2007-11-01. Then, in the “Create your own data transformation” option, enter “(a/b)*100” in the formula box and apply the transformation. For the trend line, choose “Trend Line” under “Add Data Series” and set the start date to 2007-10-01. Set both the start and end values to 100. Some cities and states, such as Detroit and Illinois, are struggling to fund their public-sector employee pensions. These crises may have seemed abrupt, but we can observe some structural causes using FRED. In the graph above, the blue line shows pension benefits paid to public-sector employees; the red and green lines show contributions from employers and employees. Adding the two revenue streams (red and green lines) creates the purple line. Note how the purple revenue line dipped below the blue payouts line in the mid-1990s and never fully rebounded. When the Great Recession hit in 2008, revenues dropped dramatically and payouts continued to rise. The graph below shows the resulting gap between pension payouts and contributions has increased markedly since the past recession. Elected officials hoped for higher future dividend and interest income to close this gap; but cities and states typically invest pension contributions in very safe assets, which have underperformed. The graph below shows that rates on 10-year Treasuries (the epitome of safe pension fund investments) have reached all-time lows since the past recession. So pension funds are being squeezed from both directions: Payouts rose faster than contributions, and returns on investments fell. Cities and states usually cannot revise or renege on benefits promised to their pensioners because pensions are often rigidly guaranteed in city charters and state constitutions. Elected officials will try to find new ways to shore up pension funds, but Baby Boomer retirements won’t make that task any easier. How these graphs were created: First graph: Add the first series (benefits) to the graph, then add the second (employer contributions) and third (employee contributions) series to the graph with the “Add Data Series” feature. To create the fourth series, start by re-adding the second series to the graph and then adding the third series by using the “Modify Data Series” option. Then, with the “Create your own transformation” option, add employer (a) and employee (b) contributions by using “a + b” in the formula box. Second graph: Start by adding benefits (a) to the graph, then use the “Modify Data Series” option to add employer (b) and employee (c) contributions as components of one data series. With the “Create your own transformation” option, use “(b + c) – a” in the formula box and change the graph type to “Area.” Third graph: Simply search for and add the “10-Year Treasury Constant Maturity Rate” series to the graph.